A crush injury in the foot occurs when the foot is compressed with considerable force between two hard surfaces. This can happen as a result of a car accident, heavy objects falling, or heavy machinery running over a foot. This type of injury can cause serious damage to the bones, nerves, and tissue in the affected area. 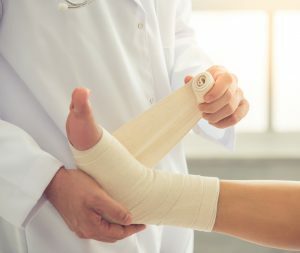 Orthopaedic Associates of St. Augustine has a comprehensive staff of St. Augustine’s best orthopaedic surgeons, with specialties in treating foot injuries. You may experience a wide array of symptoms stemming from a crush injury. Some can lead to further complications that can have serious effects. Infection – The risk for infection is higher in crush injuries than other types of wounds. Necrosis – Necrosis means the death of tissue that’s been deprived of blood too long. Compartment Syndrome – When muscle is deprived of blood for too long, compartment syndrome can set in and the affected muscles die. Rhabdomyolysis – When muscle tissue dies, it may release its contents into the bloodstream which can cause kidney failure. For minor crush injuries, you may be able to heal without medical attention. You’ll want to clean the wound with fresh water. 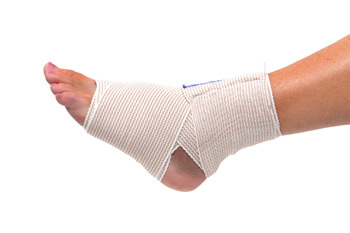 Apply ice and compression to help with swelling and pain. If there is excessive swelling, pain, or bleeding, you should see a foot specialist immediately. Your doctor will perform a physical examination of the foot and take X-rays to check for fractured bones. From there, the orthopaedic doctor will determine what treatment options are appropriate. In cases where necrosis or compartment syndrome have set in, surgery will most likely be needed. It’s important to see a doctor quickly after a substantial crush injury. Time can make a very big difference in the severity and lasting effects of your wound. If you’ve experienced a crush injury, please request an appointment online or give Orthopaedic Associates of St. Augustine a call today at 904-825-0540.